Janhvi Kapoor and Ishaan Khatter's Dhadak trailer was released today and the Kapoors (all those in Mumbai) were present at the venue. Dhadak is Janhvi's debut Bollywood film and releases a few months after her mom Sridevi's death. "I miss her today," Janhvi said at the launch, adding that the megastar wanted her to work in a film like Sairat, reports news agency PTI. Dhadak is a remake of Marathi National Award-winning film Sairat, which released in 2016. "I saw Sairat with mom at home and I remember telling her 'I wish that this was my first film and I could do something like it'. Me and mom had this big discussion on how she wanted a role like this for me and then you (Karan Johar) called and it happened," Janhvi said, PTI reported. 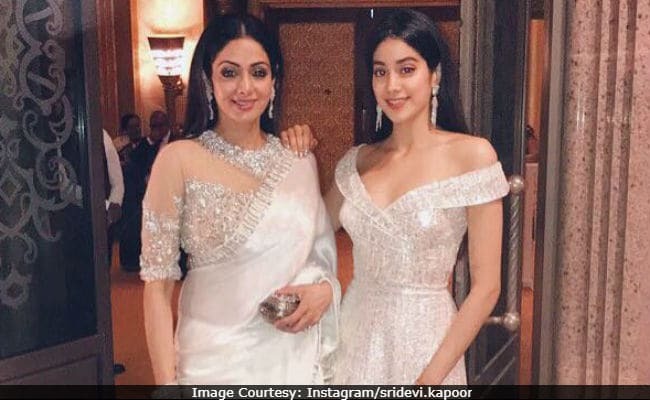 Janhvi, who had earlier revealed to Vogue magazine what Sridevi had told her earlier during Dhadak shoot, also spoked about the acting tips she received from the late actress. "I definitely miss her today... The biggest and the most helpful tip is to work hard and feel every emotion," Janhvi told PTI. Sridevi died at the age of 54 in Dubai. She was last seen in MOM, for which she was given the National Award for Best Actress this year. Janhvi, Khushi and Boney Kapoor had collected her award. Speaking about dad Boney Kapoor's advice to Janhvi, ahead of her big debut, she said, "He didn't give any tips but he has given me a lot of love and support, which is far more important." Here's how the Kapoors cheered for Janhvi. Arjun Kapoor, who is London, had written a special message for her. Tomorrow you will be part of the audience forever @janhvikapoor cause your trailer comes out... Firstly, sorry I'm not there in mumbai but I'm by your side, don't worry. I just wanted you to know this profession is amazing if you work hard, be honest, learn to take the accolades with the brickbats, respect opinions, yet follow ur own path & instinct. It's not gonna be easy but I know your are ready for all the madness that will ensue. All the best for #dhadak! I'm certain my friends @shashankkhaitan & @karanjohar have presented you & @ishaan95 as the modern Romeo & Juliet with elan !!! Of her role in Dhadak and stepping into the shoes of Rinku Rajguru, Sairat actress, Janhvi said, "What Rinku did with that character, I don't think any other actor can even touch it. But my character is different from hers. I tried portraying my character with a lot of honesty right from the beginning." Meanwhile, Ishaan added, "When we saw the film once, Shashank Khaitan (director) had told us not to watch it again because then we would get influenced to some extent. So we took a fresh approach and prepared." Produced by Karan Johar's Dharma Productions, Dhadak will hit the screens on July 20.